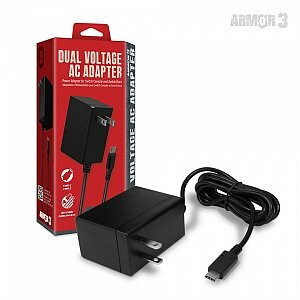 Dual Voltage AC Adapter for Switch Console and Dock! Whether itâ€™s plugged into your Dock for TV mode or as a charger for your Switch Console, this adapter will get your Switch ready for action. Charge and play your Switch Console simultaneously via a 6 ft. cable. It also provides a line of defense with short-circuit protection for your Switch. Charge up and move out, soldier!